MPLS and leased line both provide WAN connectivity. While MPLS is implemented as a full mesh, a leased line establishes a connection between two points. “MPLS” stands for “Multiprotocol Label Switching.” It is a data-carrying mechanism. Data packets are assigned labels in an MPLS network. Instead of examining the packet itself, packet-forwarding decisions are made based purely on the contents of this label. At every point a new label is attached to the packet to tell the router what has to be done with the packet until it reaches the destination. By using any protocol, it allows the creation of end-to-end circuits across all types of transport mediums. It is a complex framework of functions. Dependence on a particular data link layer technology such as Synchronous Optical Networking, Frame Relay, and Asynchronous Transfer Mode is eliminated by using this mechanism. The need for multiple layer-2 networks to satisfy the different types of traffic is also eliminated. MPLS is a member of packet-switched networks. MPLS is often referred to as layer 2.5 protocol because of its operation on an OSI model. It is designed to provide a unified data-carrying service for both packet-switching and circuit-based clients. It is used in many kinds of traffic such as Ethernet frames, SONET, native ATM, or IP packets. MPLS is replacing the older technologies at a rapid pace. It dispenses the signaling-protocol and cell-switching baggage of ATM. It also recognizes that ATM cells are no longer needed in the core of modern networks, as modern networks are so fast that even full-length packets (1500 bytes) do not incur real-time queuing delays. The main benefits of using MPLS are that it simplifies packet forwarding by reducing the degree of complexity, regulation of traffic, and network scalability. A service contract between a customer and provider is said to be a leased line. The service provider agrees to provide a symmetric telecommunication line connecting different locations, whereby the consumer agrees to pay a monthly rent. It does not have a telephone number, unlike traditional PSTN lines. Each side of the line is connected to the other. Leased lines can be used for data, Internet, or telephone. Some connect two PBXs, while others are ring down services. Leased lines are mostly used by businesses to connect their distant offices. They are always active, unlike dial-up connections. A leased line is renewed on a yearly basis. It may carry voice, data, or both. The main benefits of leased lines are that they are private, so the security level is higher along with speed, reliability, and resilience. 1.An MPLS and a leased line provide WAN connectivity. 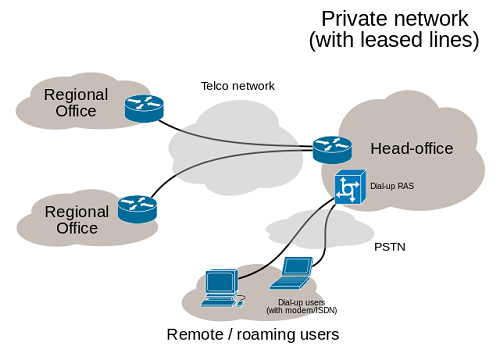 2.The main difference is that an MPLS, if desired, can be implemented as full mesh, while a leased line connects two sites. 3.A leased line is an end user solution, while an MPLS is a complex framework of functions. Celine. "Difference Between MPLS and Leased Line." DifferenceBetween.net. July 31, 2017 < http://www.differencebetween.net/technology/communication-technology/difference-between-mpls-and-leased-line/ >.